We invite male and female practioners of all ages to train with us. Ninjutsu is an ideal way to gain fitness and includes many outdoor activities and pursuits. Zero Tolerance UK is a project of BBD Newark, set up to teach the skills of self defence and self protection. We offer several short courses from 2 to 6 hours in duration, at either your place or ours. 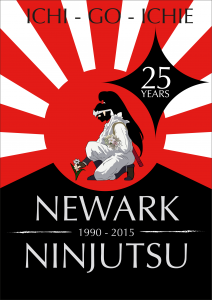 BBD Newark Ninjutsu was established in October 1990 by Kiyth Fotitt, under the authority of Chief Instructor, Shihan Brian McCarthy. We are a progressive Ninjutsu training group, the only BBD dojo covering the whole of the East Midlands. The dojo is run by Shidoshi-Ho’s, 4th Dan Kiyth Fotitt, 3rd Dan Andy Osborn and 2nd Dan Matt Clark and Sodan Alex Espin. We also run Zero Tolerance UK which is a project of BBD Newark, set up to teach the skills of self defence and self protection, for those females and males that don’t want to undergo long-term martial arts training and we also run courses for businesses, schools and colleges and other organisations. You can find us on the banks of the River Trent at Farndon. Our dojo is at 6th Newark Sea Scout Group HQ,”Riverside”, (adjacent to Farndon Marina off North End) Farndon, nearNewark in Nottinghamshire,NG24 3SX. We operate our Ninjutsu trianing all year round except over the Christmas and New Year period on Wednesday evenings 7pm till 9pm (seniors only 16+) and Sunday mornings 10an till noon (seniors and juniors from 10+).